If Washington cannot quite match New York for breadth of classical music programming, the array of performing ensembles in the area is impressively wide, especially given what a small city this is. Since the commencement a few years ago of the Baltimore Symphony Orchestra’s regular Strathmore residency, Washingtonians have enjoyed a nearly weekly suburban alternative to the NSO, but beyond this, the city hosts a number of smaller part-time orchestras. One of their number, the Ars Nova Chamber Orchestra, is to my knowledge the only conductor-less orchestra in the area. The ensemble, which I heard for the first time on Sunday, is certainly about as small as a chamber orchestra can come: there are only three first violins, for instance. Fortunately, their current venue, the small Episcopal church of St. John’s in Lafayette Square, provides just the right size for these forces. It is good to be reminded how effective a very small chamber orchestra can be—in certain repertoire, at least—in a relatively intimate space, a welcome contrast to the ill-guided tendency of major orchestras to perform Mozart and Haydn symphonies with forces reduced to numbers far below what would suit their large modern halls. The ANCO concert I attended began not in the classical era itself but with an obvious homage thereto, the Suite taken from Fauré’s Masques et bergamasques. The work’s basically classical melodic sensibility is infused with a somewhat decadent late Romantic sense of harmony—someone once quipped that this could be a pastiche of Fauré by Mozart—and to me the results straddle the line between charming and cloying. But there are some very lovely things here indeed; and, taking about 15 minutes to perform, the work never outstays its welcome. From the beginning, it was obvious that the orchestra boasts a fine wind section, and that even sans conductor, balance between winds and strings was well maintained. In fact, the biggest drawback to the diminutive size of the string section seems to be that it exposes and perhaps exaggerates tuning and ensemble difficulties, especially in the first violins; even established full-time ensembles do not always cope well technically with greatly reduced numbers of strings, and with only two or three to a part in basically symphonic music, each player is nearly as exposed as a concerto soloist, especially when playing styles and steel-strung instruments are used. (The softer attack of gut-strung instruments may make blending easier, although complete absences of vibrato poses its own difficulties for staying together!) Adding a few desks all around here would surely help in this regard, although the ensemble might then need to find a larger performing space! 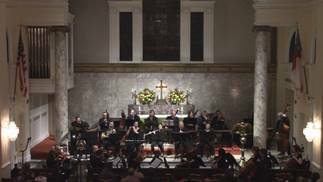 For Britten’s Rejoice in the Lamb, in an orchestration by Imogen Holst, the orchestra was joined by St. John’s small resident choir, from whose numbers the four soloists were drawn as well. Like the orchestra, the excellent choir performed without a conductor. Britten’s setting of an 18th-century poem by Christopher Smart very effectively traverses the poet’s lengthy and unmetrical verses while sustaining both momentum and lyrical flow; there is very little of the sort of Stravinskian neo-classical angularity one sometimes hears in Britten, and what traces there are of this hardly detract from the work’s charm and impact. Due to spatial constraints, I imagine, here the orchestra appeared short of a violinist, and the orchestration clearly seemed to envision a fuller string sound than what was on offer here; yet there were enough wind solos for some fine players to make an impression, notably the first clarinet and the first oboe (Chris Reardon and Robert Huffman, respectively, if I am not mistaken). For Haydn’s “Clock” Symphony, the full complement of strings was restored, such as it was, but even so, at times—in fast runs, for instance—I did wish for a somewhat larger ensemble. Yet this work, arguably more so than the other late “London” Symphonies of Haydn, needs a spring in its step, and I had no complaint on that score. Indeed it is a testament to these musicians that they can project a sense of enthusiasm and rhythmic life without a conductor; certainly there is more than enough “conducted” Haydn in the world largely bereft of these qualities.